A unique and rare case of paraneoplastic vasculitis was reported by Brady Pregerson, MD in the journal Clinical Advisor. The case described is of a 72-year-old woman with a history of hypertension and metastatic bladder cancer is who was referred to the hospital emergency department (ED) by her primary care provider with a complaint of 3 to 4 weeks of gradually worsening bilateral finger pain and cyanosis associated with a 15-lb weight loss. She denies any fever, cold exposure, palpitations, or other complaints. On examination, the patient is cachectic but appears well hydrated. She has normal vital signs except for her pulse, which is borderline in the 90s. Examination of her head and neck is normal, as is an examination of her chest and abdomen. 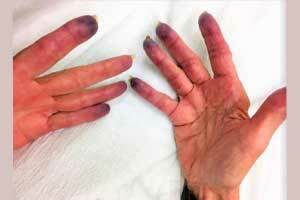 Her extremities have good peripheral pulses, but her fingers are cool and discolored. • C-reactive protein level and erythrocyte sedimentation rate were both extremely elevated. The image depicts what is most likely distal digital ischemia, most consistent with a vasculitic pattern. The next best step would be to conduct more comprehensive laboratory assessment and referral for a hematology/oncology consultation; rheumatology consult may also be considered. This patient’s diagnosis, paraneoplastic vasculitis, is a rare vascular complication of malignancy that primarily affects the skin, but this provides a good stimulus to review this and other vascular complications of malignancy outside of the well-known possibilities of deep vein thrombosis/pulmonary embolism and bleeding from vascular invasion. Cryoglobulins, C3 and C4 levels and coagulation assessment were all normal. Rheumatoid factor was normal; however, the antinuclear antibody was &gt;1:640 with a speckled pattern, suggestive of a lupus-like condition. All other lupus antibody tests were normal. The patient was thought to have a paraneoplastic vasculitis. She declined treatment.